I'm attempting to predict the Eurovision winner. It's 10.42pm and they're about to vote, so this could become an embarrassingly inaccurate post in under an hour... But nonetheless, let's give it a go. 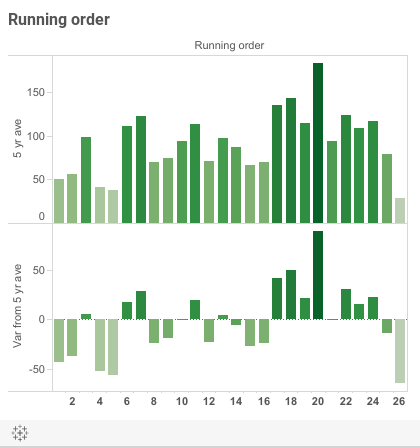 This Tableau visualisation shows the average points for each position in the running order using data from the past five years. It's pretty clear that performing between 17th and 24th is a good thing. Right now the very strong joint favourites are Austria and Sweden. They performed 11th and 13th respectively. Hmm. The most favoured countries performing between 17th and 24th are Denmark, Spain and the Netherlands. Of those, Denmark has the strongest record over the past 5 years. Nobody hates the Danes, so they don't suffer from any boycotts when the voting comes around. And Sweden, Norway and Iceland usually come through with a helpful high score for them. None of that means they'll win necessarily. But I reckon they're a decent dark horse. I also wouldn't rule out the Netherlands - they were solid last year and also benefit from being seen fairly universally as a country of Good Folk. Of course, Austria and Sweden may have the better songs... but nobody really thinks it's a song contest... right? So I didn't pick the winner. Austria took the prize from 11th in the running order. I guess their act was memorable (an endearing, bearded drag act called Conchita Wurst), which may have helped to counteract the less favourable place in the running order. However, one of my two picks, the Netherlands, did come a close second. That's encouraging. It remains pretty obvious that countries placed 17th - 24th get a big points boost.